Q: Where do I find the Slack to Ryver import tool? A: In the Settings menu at the bottom of the Ryver left navigation bar. You must be a Ryver Admin to access this menu item. Q: What data does the Slack to Ryver import bring over from Slack? A: All users, open channels, and channel messages, files, and posts. Q: What is NOT imported from Slack? A: Currently, the Slack to Ryver import does not bring over any Direct Messages or Private Channels. Due to security, the Slack team admin does not have access to everybody else’s DM’s and Private Groups through the Slack API. Q: Can I use the import tool for ongoing sync between Slack and Ryver? A: No. Currently, the Slack import serves as a one-time migration of your Users, Channels’ and Channel data. We are looking into supporting export back to Slack in the future. Q: Does Ryver have the equivalent of a Slack channel? A: Yes. Forums in Ryver are just like a slack channel. They are open to all members of your Ryver account, plus any guests invited to join the forum. Q: Why don’t you just call them channels, then? A: The channel term is derived from Internet Relay Chat (IRC), popular amongst tech communities. We’re trying to appeal to a broader audience. One key element of Ryver Forums, not found in Slack, is the TOPICS tab where all topics and associated replies are located. It is similar in nature to traditional forum software. Or you can think of it as a Facebook wall for your project or team. Topics are really powerful in Ryver, supporting formatting and multiple attachments. You can also attach files to your topic replies! Q: Do my Slack posts get imported as a message or topic in Ryver? A: Both! We insert a chat message with a preview, to keep the continuity of your imported chat discussion. The chat message contains a link to the full topic, which resides in the topic stream for that forum. Q: Do any other Slack messages get converted to Ryver posts? A: Yes. If you have a file in a Slack channel with comments on it, we will turn that into a topic, with that file as an attachment. We then port over the comments underneath that topic as a topic reply. You will still see the file upload in your chat history as well. A: We do import messages that were created by integration bots. However, the integration configurations themselves are not carried over into Ryver. Please check out the 1000+ apps that we integrate with through Zapier. Q: Are users automatically sent invites when the import is completed? A: No. We give you a chance to review the data and deactivate users if you wish. 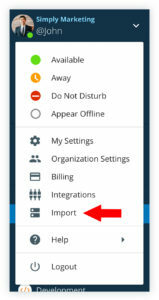 You can then return to the import view and send out bulk invites when you are ready. Q: How are Slack Restricted Accounts and Guests handled? A: Slack Restricted Accounts and Guests both get converted to guests in Ryver. Since Ryver has no restrictions on how many forums or teams a guest can be added to, we don’t need two forms of restricted users.